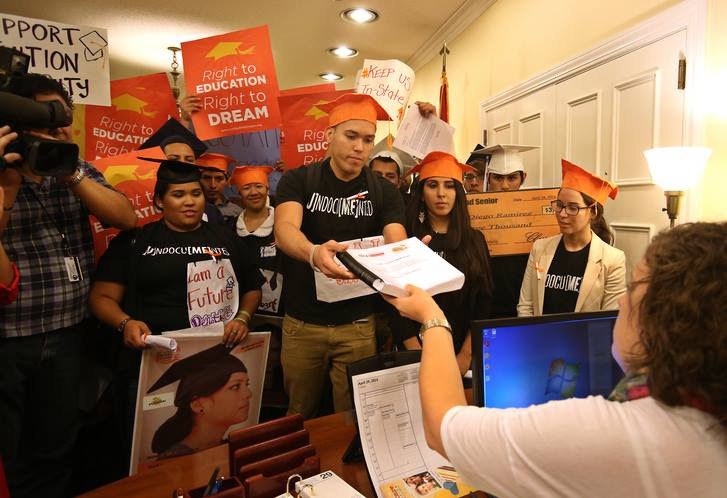 Home > Posts tagged "DACA"
1st Anniversary of In-State Tuition in Florida! My name is Julio Calderon and I am undocumented. I came to the United States when I was 16 years old, and so, I did not benefit from DACA. I went to Highschool never fully believing that College or University was an opportunity for me. After I graduated, I worked in construction and found my way to Miami Dade College after a counselor helped me apply. But the catch was that I had to pay out of state tuition. A year ago today, I attended my first year of University and I found myself struggling to pay thousands of dollars solely on tuition fees. Then something great happened! Florida passed an in-state tuition to allow local undocumented students like me pay the same tuition as our classmates. That’s me in the picture handing a petition to the Governor’s office to sign this law. It really made a difference. Like myself, there are so many students out there who still believe that going to a College or University is an impossible dream. That’s why my work at FLIC is to make sure that more undocumented students are informed and know that IT IS POSSIBLE to go to school. Pam Bondi wants to deport my mom. Can you help us? My name is Jose Palacios. I came to Tampa, FL, 18 years ago when I was only a boy. Even though my mom worked very hard to make sure we had everything we needed, for many years we have lived in fear of being deported. My life changed when Obama announced DACA two years ago, a relief for young immigrants like me. Now the same can happen for my mom with DAPA, a relief for parents. If she gets it, she can live out her dream of starting her own business. But instead of letting my mom contribute to our state, our Attorney General Pam Bondi is suing Obama’s relief programs! Join me in telling Pam Bondi: Why do you want to deport my mom and separate thousands of immigrant families in Florida? AG Pam Bondi added Florida’s name to a lawsuit against DAPA and DACA. And last week, a judge in Texas ruled against the President’s programs and my mom. Why is Pam Bondi, who grew up in the same city we live in, more interested in slamming the doors shut on my mom than giving her a chance to contribute? Click here to tell AG Bondi that hardworking immigrants should be welcomed by Florida, not attacked out of politics!